On farm station where methane is pre-conditioned before being sent to central refinery. RALEIGH – A renewable energy project in Duplin County is using swine-derived biogas to become the first in North Carolina to create natural gas that is used by local utility companies. The project, Optima KV, pipes methane gas from five local hog farms to a central refinery where it is cleaned and injected into the pipeline. Optima KV is a collaboration between local farmers, Smithfield Foods, investors and Cavanaugh Associates LLC. The project, which has been ready since December, was connected to the pipeline last week. 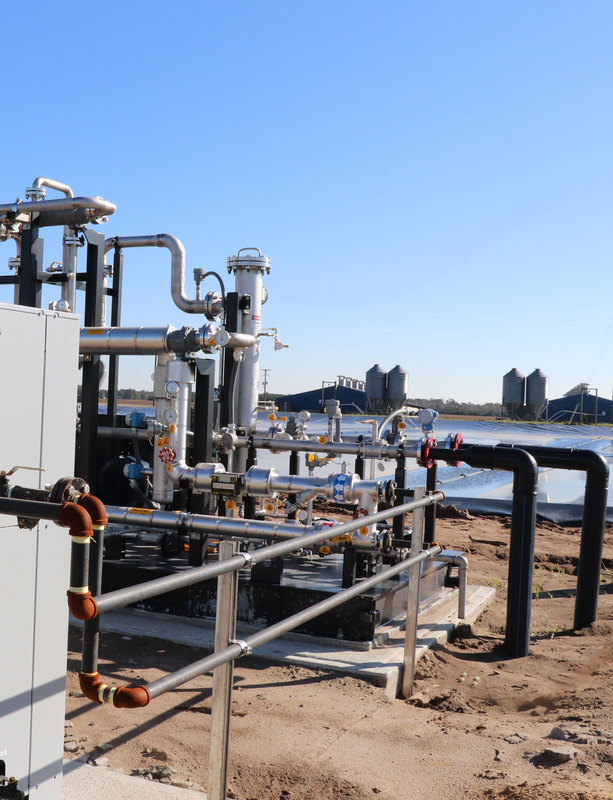 The Optima KV system works much like other swine waste-to-energy projects, in that the methane is captured in an anaerobic digester that is similar in its appearance and operation to a covered lagoon. At each farm, a small, low-power compressor pulls biogas from beneath the cover, filters the biogas for particulates, and removes moisture through a simple condenser, a step referred to as pre-conditioning. The pre-conditioned gas is then transmitted to a central refinery through low-pressure, small diameter pipes. Each participating farm is less than three miles away from that refinery, which is located on land owned by Smithfield Foods. At the central refinery, a series of filtration processes remove the carbon dioxide and other constituents, which are separated and flared. This process leaves a product gas that is at least 96 percent methane, or natural gas. Once refined, the product gas (also known as renewable natural gas) is pressurized to 1000 psi for injection into the existing pipeline network, owned by Piedmont Natural Gas. A developing market for biogas has been an important factor in making the project possible at this time. Duke Energy has committed to buying the swine waste-derived biogas, which will help the company meet state-mandated goals. Under North Carolina’s Renewable Energy Portfolio Standard law, electric utilities must meet specific compliance targets for swine and poultry waste. While many other states have adopted renewable energy portfolio laws, North Carolina remains the only state in the nation that encourages swine waste-to-energy projects with such a law. Optima KV central refinery is built for more capacity than is currently utilized and the opportunity exists for more farms to be connected. According to the project designer, Gus Simmons of Cavanaugh Associates LLC, North Carolina is recognized for having the third greatest bioenergy potential in the U.S., mostly because of the opportunity to capture biogas from the swine industry. “Since renewable natural gas can be used for any purpose currently met by conventional natural gas – such as electricity generation, transportation fuels, grain drying, manufacturing – this creates great opportunities for the North Carolina swine industry to export farm-based energy to customers across the country,” said Simmons. Simmons was recently honored with the N.C. Pork Council Award for Excellence in Innovation, which recognizes people who use new innovations to advance the pork industry. To learn more about this project, see the cover story in our winter issue of the NC Pork Report magazine: http://www.nxtbook.com/naylor/NCPQ/NCPQ0417/index.php#/20.